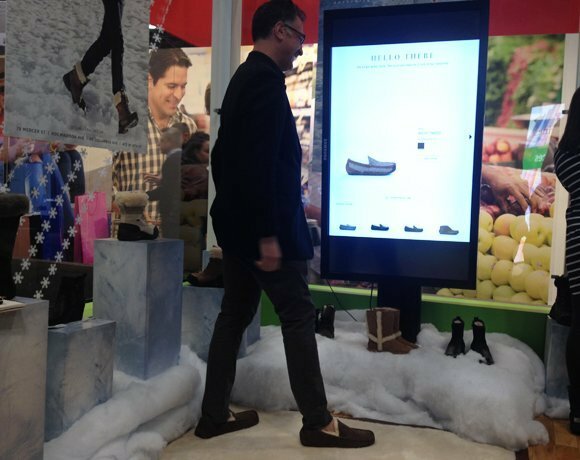 Ugg Australia is trialing a smart mat solution which allows shoppers to view more products electronically via an interactive screen. The retailer is trialing an RFID smart mat in two stores in the US in order to extend its product line to include online stock. Using the Demandware content portal, the customer can place an RFID-tagged Ugg boot onto the smart mat which recognizes the product and sends additional information to the ten-foot screen in front of the customer. The retailer is starting to carry fewer shows in store and the new technology allows stores to show all the stock available online. Customers can interact with the screen by tapping in their phone number if they wish to have a webpage sent to them to consider later and share via social networks. In a bid to tie up the offline and online channels, the RFID smart mat solution can also link to customers’ past purchases if they wish to log-in, which loads up recommendations linked to previous buys.